Gus Van Sant's "Milk" is one of the very best films of the year. It's an absolute triumph, filled with life, strength, hope, passion, and emotion. And it is just ever so timely. In San Francisco in 1978, they were fighting against Proposition 6. Now we find ourselves fighting against Proposition 8. It was a vital issue then, and it's if not an even more important issue now. Harvey Milk sparked cultural motivation for change, and he was in the middle of it all. And now, thirty years later, here's "Milk" bristling with the same purpose and meaning for today. We've just been introduced to the first major contender for Best Picture. Have California voters decided the results of the Academy Awards this year? We'll just have to wait and see. Sean Penn has gracefully secured himself a spot on the ballot for Best Actors this year. 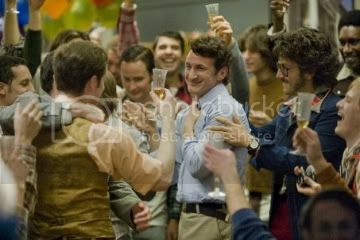 He's at the center and heart of this movie, and he disappears into the role of Harvey Milk. Penn captures the essence of Milk through his voice and gestures, but it's deeper within where he finds this man's core and brings it out through his performance. It's phenomenal. Penn is a wonderfully gifted actor who doesn't play up any aspect of Milk or make him out to be some sort of great hero, but rather just plays him as he is: a real man. His personal life is flawed and a little messy. He's friendly, likes to laugh, and can be a little vulnerable but also sharply witty when necessary. Once a closeted man, he lives his life completely in the open, and he is played with utter liberation by Penn. The movie opens in 1978 with Harvey Milk sitting at his dinner table making a recording to be played in the event of his assassination. We then flashback to the early 1970s when Harvey opens a small camera shop nearby Castro Theater in San Francisco with his lover, Scott Smith (James Franco). It's here where Harvey first witnesses America's largest open gay community being abused by the local police force. Through this, Harvey realizes the potential of the community and decides he wants to do something important and begins organizing. Making the transformation from hippie to activist wasn't an easy road, however, and it took Milk three times running to being elected to the Board of Supervisors in 1977. He was officially the first openly gay man to be voted into a major public office. And Harvey Milk had some great support along the way. A lesbian campaign manager named Anne Kronenberg (Alison Pill) largely paves the way, along with an energetic young gay activist named Cleve Jones (Emile Hirsch), and many others within the gay elite help to build a movement from the ground up. Milk and his growing political community are put up against anti-gay-right laws promoted by the likes of orange juice spokeswoman Anita Bryant who despicably speaks for herself in real TV interviews. Milk's personal relationships are also given note through the movie, including Scott Smith who eventually leaves Milk realizing he'll never top politics as the center of his attention. Milk then gets involved with an emotionally unstable Latino boy-toy named Jack Lira (Diego Luna), a relationship that leads to the worst possible end. Sean Penn is surrounded by other great supporting roles, most notably a very playful Hirsch, Franco, who doesn't seem to mind kissing Penn like he means it, and a strangely affecting Luna. It's Josh Brolin, though, who is most powerful and haunting as another member on the Board of Supervisors, Dan White. Milk's most crucial relationship is the relationship he forms with this man. Brolin presents us a tormented man torn between his own inner emotions and beliefs. He gives the outward appearance of a devout Catholic, a loving husband, and a man backed by the American flag, but there lies something else. There's a most disturbing scene where a drunken White confronts Milk outside a party and reveals his dire isolation and desperation. Cleve Jones pokes fun saying, "Is it just me, or is he kinda cute?" while Milk boldly states, "I think he may be one of us." It all leads to November 27, 1978 when Dan White slips into City Hall and assassinates both Mayor Mascone (Victor Garber) and Harvey White, tragically ending two lives. With beautiful direction from Gus Van Sant teamed with an original screenplay by Dustin Lance Black, "Milk" strikes a personal chord on so many levels. Throughout the film, Van Sant interlaces real footage to give the true essence of San Francisco in the 70s, and it adds effective richness to the storytelling. There is a most remarkable use of real footage near the film's end that shows a marching line of people carrying lit candles for as far as the eye can see in mourning of Milk. It's a gorgeously heartbreaking and astonishing moment and one of the most moving moments we'll witness on the big screen this year. In predicting his own assassination, Harvey Milk said, "If a bullet should enter my brain, let that bullet destroy every closet door." Milk's story is even more than just about gay rights, as well. It's a story about the uplifting feeling of hope, the hope of moving forward, and the hope that such progression in America can still be made.